In the center background, a man-made structure—appearing, though distant, to be composed of walls and towers—crests an imposing promontory. To the right of this bluff a high, wooded hill rises to the top corner of the image; trees cluster at its base. Two human figures appear on a hillock in the left foreground: one standing, the other crouching, head bent. In the grassy areas extending to the right, a cluster of four trees stands in the middle ground. This image was printed in William Gilpin's Observations on the Western Parts of England, Relative Chiefly to Picturesque Beauty. To Which are Added, a Few Remarks on the Picturesque Beauties of the Isle of Wight (London, 1798). The aquatints engraved for Gilpin’s Tours were based on sketches made by Gilpin himself. A comparison of similar aquatints from the second, third and fifth editions reveals subtle variations among them and suggest that new aquatint etchings were used in each printing. By the 1790s, the British aristocrats who had grown accustomed to visiting the sites of ancient Greece and Italy had been cut off from the Continent by the violent and unstable political situation (Andrews 34). As a result, domestic sites came to constitute a new "Grand Tour." Gilpin highlighted the affordability of travel in England, Wales and Scotland, and argued that such national sites held the potential for enacting moral edification (Bermingham 86). This potential arose in the exposure of the viewer to the divine in nature: "a search after beauty should naturally lead the mind to the great origin of all beauty . . . Nature is but a name for an effect, / Whose cause is God" (Gilpin, Three Essays; 46-7). One of Gilpin’s former students at Cheam, Colonel William Mitford, heard of his former schoolmaster’s desire to retire from the school at Cheam and offered him a wage in Boldre. Gilpin accepted, and he served as the Vicar of Boldre, Hampshire from 1777 until his death in 1804 (Templeman 148). From the beginning of this appointment until 1791, he kept up his drawing while attending to the affairs of his new parish community. He initiated an association to aid the impoverished in the neighboring town of Lymington and supported the foundation of Sunday and day schools in Boldre (Templeman 186-91). The revenues from sales of his Tours allowed him to establish two schools in Boldre in 1791 (Gilpin: qtd. in Templeman 194). Between 1797 and 1800, a period of prolonged illness, he published another set of sermons and additional accounts of his domestic travels (Observations on the Western Parts of England), as well as working to arrange the the posthumous sale of his works in order to establish an endowment for his schools (Barbier 92; Templeman 207-9). 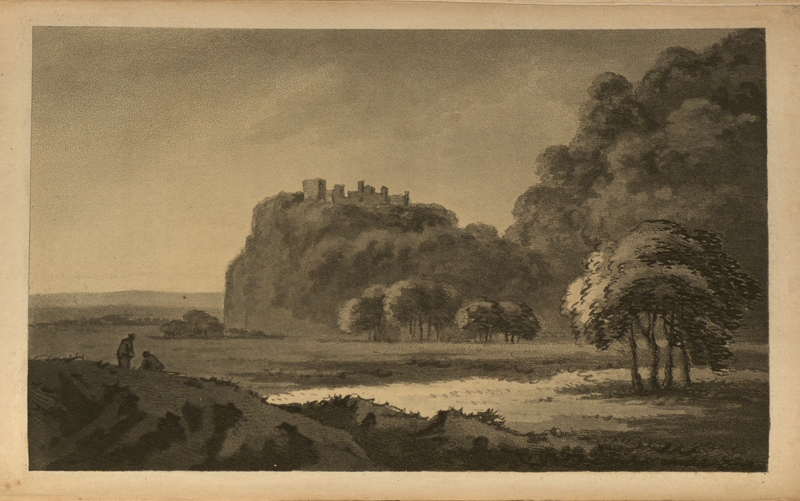 See other editions of this text (Gilpin's Observations on the Western Parts of England, Relative Chiefly to Picturesque Beauty…) for other versions of Dunster Castle. This image of tourists before a view of Dunster Castle highlights the importance assigned to the interaction of persons with natural or constructed elements of the landscape in Romantic-era tourism. Gilpin’s inclusion of human figures in this view of Dunster Castle departs from the way in which he represents tours of the River Wye. The figures in the corner of the image (with their backs to us) are engaged in business of their own, not observant of the scene that Gilpin presents to his reader and viewer. If they were looking at the castle, they might provide a model for the viewer who seeks to enter the scene. Kim Michasiw notes that one of Gilpin’s objectives was to make the domestic British landscape attractive for the generation deprived of the Grand Tour (on the Continent) due to the political strife of the late nineteenth century. Michasiw suggests that, by following the ideals of landscape painting, Gilpin could recreate an interaction between landscape and viewer that would enthrall the spectator, inviting him or her into the created, illusionistic space. Furthermore, human figures could be included to highlight the sublime qualities of the natural scene, but only in so far as they did not detract from the power of the sublime scene by engaging the viewer. For example, any persons included in an image were turned away from the viewer so as not to distract him or her from the scene itself (Michasiw 84-6). The scene follows this design, but adds a further complication. Busy with their own affairs, neither looking at the prospect of Dunster nor engaging with the viewer, these figures more closely resemble proprietors than tourists. Michasiw identifies such an "improper" and irreverent audience as the target readers of Price and Payne Knight, not those domestic tourists to whom Gilpin hoped to appeal (86); as a result, the figures in the image attract (and distract) our attention. Clear identification of the figures is, however, a limited endeavor. They may be proprietors, but they could also be "read" as tourists sitting down to draw a sketch or paint a watercolor of the landscape before them. Regardless of their intended role, this view of Dunster presents both the pair of occupied figures and the castle as images with which the viewer may engage. Consequently, the image breaks away from common standards of landscape painting, and the personal affairs of the proprietors or tourists become as important as the purported focus on the picturesque vista. Andrews, Malcolm. The Search for the Picturesque: Landscape Aesthetics and Tourism in Britain, 1760-1800. Stanford: Stanford UP, 1989. Print. Bermingham, Ann. "The Picturesque and Ready-to-wear Femininity." The Politics of the Picturesque: Literature, Landscape, and Aesthetics since 1770. Ed. Stephen Copley and Peter Garside. Cambridge: Cambridge UP, 1994. Print. 81-119. Gilpin, William. An Essay on Prints.3rd ed. London, 1781. Eighteenth Century Collections Online. Gale. University of Wisconsin - Madison. Web. 21 May 2009. ---. Three Essays: On Picturesque Beauty; on Picturesque Travel; and on Sketching Landscape: to Which Is Added a Poem, on Landscape Painting. By William Gilpin, ... London, 1792. Eighteenth Century Collections Online. Gale. University of Wisconsin - Madison. 21 May 2009. Piebenga, Sophieke. “Gilpin, William Sawrey (1761/2–1843).” Oxford Dictionary of National Biography. Ed. H. C. G. Matthew and Brian Harrison. Oxford: OUP, 2004. Online ed. Ed. Lawrence Goldman. Jan. 2008. Web. 2 Apr. 2009. Templeman, William D. The Life and Work of William Gilpin (1724-1804): Master of the Picturesque and Vicar of Boldre. Urbana: U of Illinois P, 1939. Print. University of Illinois Studies in Language and Literature 24.3-4.